FrogScapes reflects our love of nature and our passion for life. We incorporate fun and laughter into our daily lives. FrogScapes started with "would you like to kiss a frog, or photograph one? ", which led to love and a wedding, and then to a pet red-eyed green tree frog named Pixel - and it has evolved from there. The photos herein are a direct result of our appreciation of life's everyday miracles and our love of frogs. FYI, No frogs are hurt or stressed while creating these photographs. Lisa Cuchara fell head-over-heels in love with frogs the first time she and her photographer husband Tom were invited to photograph a red-eyed tree frog. Before long, the couple was clearing out their space in their home for terrariums full of well-loved amphibians! As it turned out, Lisa’s uncanny ability to put frogs at ease set the couple on a new creative path: producing whimsical frog portraits. Through patience, care―and plenty of snacks!―they have been able to achieve incredible images while keeping their animal friends totally content. In fact, some of their frogs now know that they will fed after being taken out of their terrarium―so they sign to Lisa and Tom or smush their faces up to the glass, wanting to be photographed! 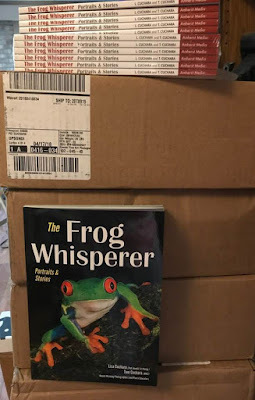 Whether sitting quietly on a flower or humorously interacting with a carefully selected prop, these frogs are sure to bring a smile to the face of any animal lover. 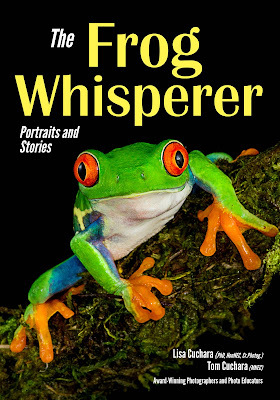 Authors Lisa Cuchara (PhD, Cr.Photog., HonNEC) and Tom Cuchara (MNEC) are professional photographers and animal lovers who share their home with three dogs, two cats, a red-eyed green tree frog and a bunch of other frogs, chameleons, and other critters. When they’re not out shooting assignments for their clients or leading photo workshops and tours, they can often be found creating whimsical frog images with their willing pets―who get ample snacks in exchange for patient posing! Lisa’s uncanny ability to put frogs at ease with her gentle care and loving demeanor has earned her the nickname “The Frog Whisperer.” Her frog images have earned merits in Professional Photographers of America print competitions and been featured in Quinnipiac Magazine as well as other publications. Lisa and Tom reside in Hamden, CT.
Lisa and Tom provide this material for your informational and entertainment purpose only. Our sites do allow for reader feedback, but we can not be held responsible for all of their content. Lisa and Tom of BREA Photos LLC do moderate and we will remove anything that is deemed inappropriate. Readers agree not to post intentionally mean or harmful comments, upload virus, spam, or anything illegal. Lisa and Tom of BREA Photos LLC can not be held responsible if something like that does happen to occur. We do sometimes provide links to external websites for informational purposes as a convenience to our readers, but we have no control over them. We try to ensure that the websites linked and any other links from this website contain "safe" content for everyone, but be aware that some sites may contain explicit and other potentially offensive material due to the subject matter of the photographs exhibited. Users should contact the external website with questions or concerns regarding its content. The content of a linked website may change at any time; if you find a link that is broken (or inappropriate) please contact us.